Your blog should standout as much as you do, and that’s why there was collected these WordPress magazine themes in one place for a reason to do not leave you without any solution that fits your magazine website. These modern and unique magazine themes are truly one of a kind. From the stunning homepage slider to the thoughtful page templates for authors, archives, site map and more. All of them are sure to captivate you and your readers. Most of this top 10 WordPress magazine theme can have a look by shrinking your browser size while looking at the demo. All themes are full of features aimed to please like the awesome homepage, archive pagination options and are perfect for news for all sorts of content. In some of these themes are included different shortcodes which can be inserted both by adding shortcode in the post field or by using specific shortcode insertion buttons which make using the shortcode much easier. Try one of these themes and have absolutely no fluff or fuss – it’s just you and your content. Magazine is an indispensable Magazine Style WordPress Theme aimed at providing you with an easy-to-use tool to share your discoveries and showcase the latest findings. Whether you’re looking to share the latest cool things out there, write reviews for your favorite products, keep your visitors engaged with the latest videos, the hottest breaking news or special events, Magazine is designed to fulfill these and more. Everything just works the way you expect it to. This is what Magazine is all about: the right tool, in the right place, right when you need it! Gonzo – is a unique responsive WordPress magazine theme with different attractive elements. Perfect for news for all sorts of content. Contains blog posts with integrated ratings, videos and slideshow. Design trends are constantly changing and it’s critical to adapt at the drop of a hat; stay ahead of the game with Gonzo, an incredibly customizable magazine & blog theme designed to meet your every need. Gonzo’s clean and highly adaptable form was specifically crafted to appeal to every niche and comes chock-full of premium features. Whatever your magazine or blog needs, Gonzo is here to deliver! Kalemat is a simple in use, lovely looking theme done for WordPress technology users. May serve as a good platform for writing, blogging, reviewing. This WordPress magazine theme has variety of post formats, page templates and custom widgets. Also is available in unlimited color schemes. Fully adapted for Retina Display and is responsive as well. One click demo installation, well prepared documentation and informative video tutorials would let your magazine managing as easy as it is possible. Newsbold is a responsive WordPress magazine theme, created base from Bootstrap. This theme is excellent for blog, magazine, news and web for review. This theme have an opportunity create your own layout using layout builder. Newsbold is powerful with custom page builder, widgets, theme options, unlimited colors, review system, user review, custom sidebar, custom background and much more! Cassia is a new responsive WordPress magazine theme for blogs, magazines, newspapers and news portals. It’s fully responsive and optimized for desktops, tablets and smartphones. This theme comes with free updates and technical support. Cassia theme is very easy to work without touch to code. This WordPress magazine theme is full responsive and this theme support you drag and drop to build your own home design, easy duplicate or delete anything. Cassia is a clean and beautiful personal blog theme with responsive layout and elegant styling. The WordPress magazine theme – Today – was built to embrace new technologies and web standards. Create any look you feel with this highly customizable theme. Today is a premium news magazine theme created for those inspired to create magazine, fashion news, blog type website’s. These features make navigating the theme a pleasant experience and we all want that for our beloved users so they keep coming back. Today theme is an outstanding source of information and entertainment for all the people. Besides the finest news, here you can also stay up to date with the daily business ideas and tech evolution. This WordPress magazine theme – Particle – is perfect for personal blogs, magazine sites, modern and fully responsive (try resizing your browser) and portfolio too. 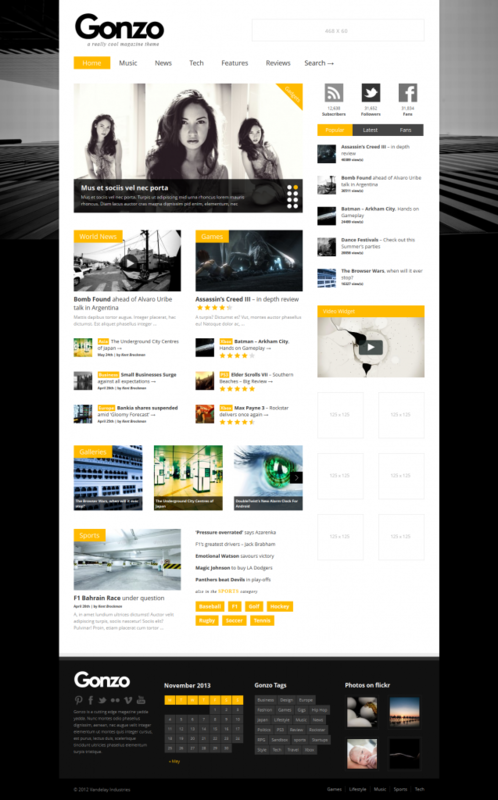 Particle is multipurpose, functional and modern WordPress magazine theme. You can have fun on the run by posting videos, photos, links and much more… Look through out this theme features list. Anivia is a fully responsive theme that is ideal for blogs, magazines or minimal portfolios. This theme is unique looking template which is compatible with WooCommerce plugins. Anivia focuses on the most important thing from a blog, the content. You can practically change any colors and font styles on Anivia easily. You can made the style changes using our Theme Options and default WordPress theme customizer. This WordPress magazine theme personal blog theme comes with a responsive layout, the layout will adjust automatically when viewed on desktop and mobile devices. Valenti is the premier magazine theme that combines both form and function into one comprehensive WordPress theme. This sleek, modern theme is fully-responsive and comes with four different ad units, including a custom wallpaper ad. Valenti comes with integration of bbPress, different widgets, unique homepage drag and drop builder and more. Valenti also comes with a unique megamenu system for beautiful drop down menus and also the ability to set the featured image of a post to have a parallax effect.